next to Horwich Parkway railway station. and the Bolton Wanders Macron Football Stadium. Sunday 15th SEPTEMBER 2019 11-4pm Due to suppliers demand will Now being held in the USN Arena, find us just off Junction 6 off the M61 Motorway. This fayre will showcase Superior cat walk Shows Featuring First class models and approximately 130+ supplier stands. The Great Northern Wedding Show returns on Sunday 15th SEPTEMBER 2019 at Bolton USN Arena. This show is what our visitors call ‘The Big One’ as we have over 130 exhibitors all under one roof in just one day! It’s free entry when you pre-register for you and your guests. before 9pm Saturday 14th SEPTEMBER 2019 otherwise it’s just £2 per person on the day. Loads going on and lots for you to see; catwalk shows, live entertainment, demonstrations, samples, goody bags (limited to first 500), refreshments available all day. The Bolton Arena is a multi-purpose indoor arena, located at Middlebrook. It is the location for our Great Northern Wedding Shows and being situated over the road from the Macron Stadium provides easy access and large amounts of parking for all our visitors. 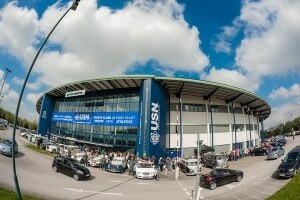 Bolton USN Arena “One Day Only” A real world of weddings all under one roof! The Biggest Wedding Show in Lancashire Be very early for this one! To download your free entry tickets just click or type in the following.